While the general structure of financial statements Analysis of Financial StatementsHow to perform Analysis of Financial Statements. This guide will teach you to perform financial statement analysis of the income statement, balance sheet, and cash flow statement including margins, ratios, growth, liquiditiy, leverage, rates of return and profitability. See examples and step-by-step instructionfor banks isn’t that much different from a regular company, the nature of banking operations means that there are significant differences in the subclassification of accounts. 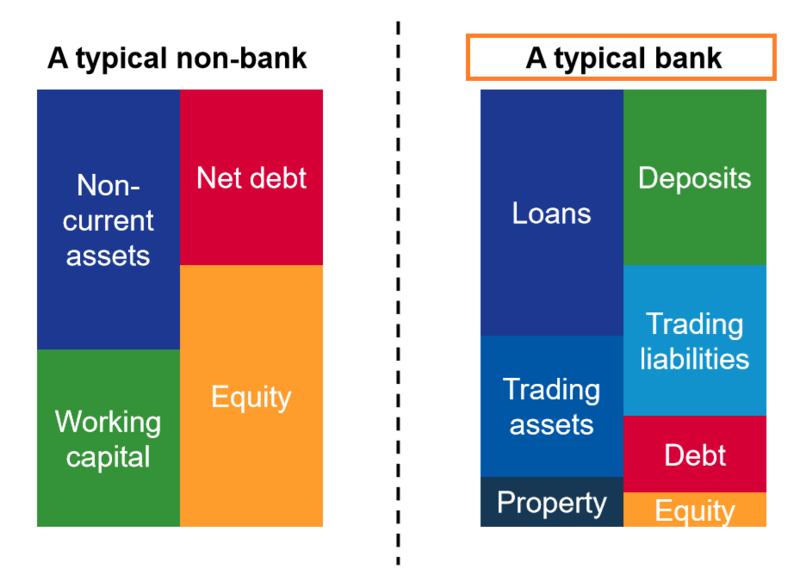 Banks use much more leverage than other businesses and earn a spread between the interest income they generate on their assets (loans) and their cost of funds (customer deposits). A typical balance sheetBalance SheetThe balance sheet is one of the three fundamental financial statements. These statements are key to both financial modeling and accounting. The balance sheet displays the company’s total assets, and how these assets are financed, through either debt or equity. Assets = Liabilities + Equity consists of the core accounting equation, assets equal liabilities plus equity. Under these accounts, some companies may have other large classes such as PP&E, intangible assetsIntangible AssetsAccording to the IFRS, intangible assets are identifiable, non-monetary assets without physical substance. Like all assets, intangible assets are those that are expected to generate economic returns for the company in the future. As a long-term asset, this expectation extends for more than one year, current assets, accounts receivablesAccountingOur Accounting guides and resources are designed as self-study guides to learn accounting and finance at your own pace. Browse hundreds of articles on important topics such as the income statement, balance sheet, cash flow statement, depreciation methods, how to link the 3 statements, debits & credits, journal entries, accounts payables and such. Recall from CFI’s Balance Sheet GuideBalance SheetThe balance sheet is one of the three fundamental financial statements. These statements are key to both financial modeling and accounting. The balance sheet displays the company’s total assets, and how these assets are financed, through either debt or equity. Assets = Liabilities + Equity that ASSETS = LIABILITIES + EQUITY. A bank’s balance sheet has certain unique items. We visit each unique line itemProjecting Balance Sheet Line ItemsProjecting balance sheet line items involves analyzing working capital, PP&E, debt share capital and net income. This guide will break down step-by-step how to calculate and then forecast each of the line items necessary to forecast a complete balance sheet and build a 3 statement financial model. in the subsections below. To learn more, launch our finance courses online! The main operations and source of revenue for banks are their loan and deposit operations. Customers deposit money at the bank, for which they receive small interest ranging in the tens of basis points. The bank then lends funds out at a much higher rate, profiting from the difference in interest rates. As such, loans to customers are classified as assets. This is because the bank expects to receive interest and principal repaymentsDebt ScheduleA debt schedule lays out all of the debt a business has in a schedule based on its maturity and interest rate. In financial modeling, interest expense flows into the income statement, closing debt balance flows onto the balance sheet, principal repayments flow through the cash flow statement, completing the scheudle for loans in the future, and thus generate economic benefit from the loans. Deposits, on the other hand, are expected to be withdrawn by customers or also pay out interest payments, generating an economic outflow in the future. Deposits to customers are thus, classified as liabilities. In the questions of financial statements for banks, where do these banks store their money? It’s like the age old question: do barbers cut their own hair? The answer isn’t too crazy. Most countries have a central bank, where most (or all) national banks will store their money and profits. Deposits from a bank in a central bank are considered assets, similar to cash and equivalents for a regular company. This is because the bank can withdraw these deposits rather easily. It is also expected to receive a small interest payment using the central bank’s prime rate. Banks may hold marketable securitiesMarketable SecuritiesMarketable securities are unrestricted short-term financial instruments that are issued either for equity securities or for debt securities of a publicly listed company. The issuing company creates these instruments for the express purpose of raising funds to further finance business activities and expansion. or certain currenciesCryptocurrencyCryptocurrency is a form of digital currency that is based on blockchain networking. Cryptocurrency like Bitcoin and Ethereum are becoming widely accepted. Some people are confused about what makes cryptocurrency valuable and what makes it efficient as a means of storing and transferring value. for the purposes of trading. These will naturally be considered trading assets. They may have trading liabilities if the securities they purchase decline in value. 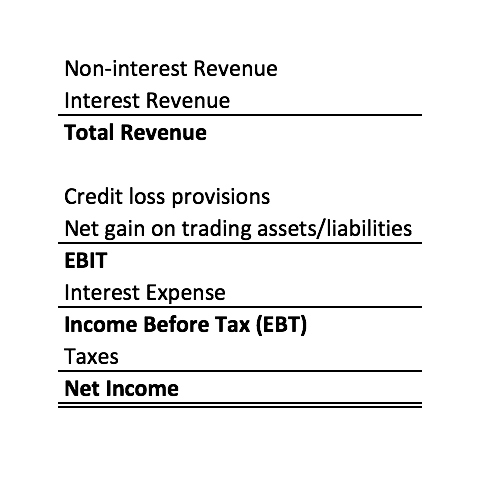 Again, the overall structure of an income statement for a bank doesn’t stray too far from a regular income statement. The top of the income statement is revenue and the bottom is net income. Again, let’s walk through the unique line itemsProjecting Income Statement Line ItemsWe discuss the different methods of projecting income statement line items. Projecting income statement line items begins with sales revenue, then cost of goods sold, gross profit, selling general and admin (SG&A), depreciation, amortization, taxes, EBITDA, and net income. This guide has examples not found in common income statements. These revenues come from anything that does not constitute interest revenue. Interest revenue will capture the interest payments the bank receives on the loans it issues. Sometimes, this line item will only state gross interest revenue. Other times, this line will consolidate gross interest revenue and deduct interest expense to find net interest revenue. This interest expenseInterest ExpenseInterest expense arises out of a company that finances through debt or capital leases. Interest is found in the income statement, but can also be calculated through the debt schedule. The schedule should outline all the major pieces of debt a company has on its balance sheet, and calculate interest by multiplying the will be the direct interest expense paid to the deposits used to fund the loans, and will not include interest expense from general debt. Just like accounts receivables and bad debt expense, a company must prepare in the event that borrowers are not able to pay off their loans. These bad pieces of credit are written off in the income statement, as a provision for credit loss. Three financial statement modelThree Financial StatementsThe three financial statements are the income statement, the balance sheet, and the statement of cash flows. These three core statements are intricately linked to each other and this guide will explain how they all fit together. By following the steps below you'll be able to connect the three statements on your own.